Note: If you are already an IABS member, click here to access the store. Get Access to Our Members-Only Store – Membership is Free! Members of the Irish American Baseball Society have access to the IABS online store, where we offer exclusive IABS gear as well as Irish American Baseball Hall of Fame gear. Here’s a preview of what you will see in the store when you become an IABS member. BTW, membership is free! Click here to join! Our Shamrock Diamond black baseball cap has quickly become the most popular item in our store. 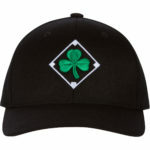 The cap features a raised embroidery shamrock on the front of the cap, enclosed in a white baseball diamond. The back of the cap features an Irish flag. The cap is a high quality flexfit cap. The Irish American Baseball Hall of Fame, located in the heart of New York City, is a proud partner of the Irish American Baseball Society. We have several styles of cotton and performance dri-fit polo shirts available, each with an embroidered IABHOF logo. The IABHOF logo includes Irish and American flags set against a baseball and two baseball bats. This awesome women’s T-shirt spells out “I Love Irish Baseball” in icons that everyone will understand. There are plenty of other shirts and caps available. Join the Irish American Baseball Society today and get access to the store. Success! Thanks for Joining IABS. Please add info@irishbaseball.org to your email contacts list so you receive our next email newsletter.